Morguefiles; Kosovo selfie by Dave Long. Hello, Displaced Nationers! I am standing in for A Picture Says… columnist James King, who unfortunately can’t be with us this month. James left the choice up to me, so I’ve extended an invitation to Dave Long, a U.S.-born photographer living in Salzburg, Austria. I discovered Dave through his involvement with under a grey sky…, the personal Web site of Paul Scraton, a Brit living in Berlin, Germany. Paul plans to produce a quarterly journal called Elsewhere, as reported in a recent Displaced Dispatch. Dave specializes in commercial and fine-art photography, with an emphasis on dramatic landscapes, extreme sports and historical architecture. 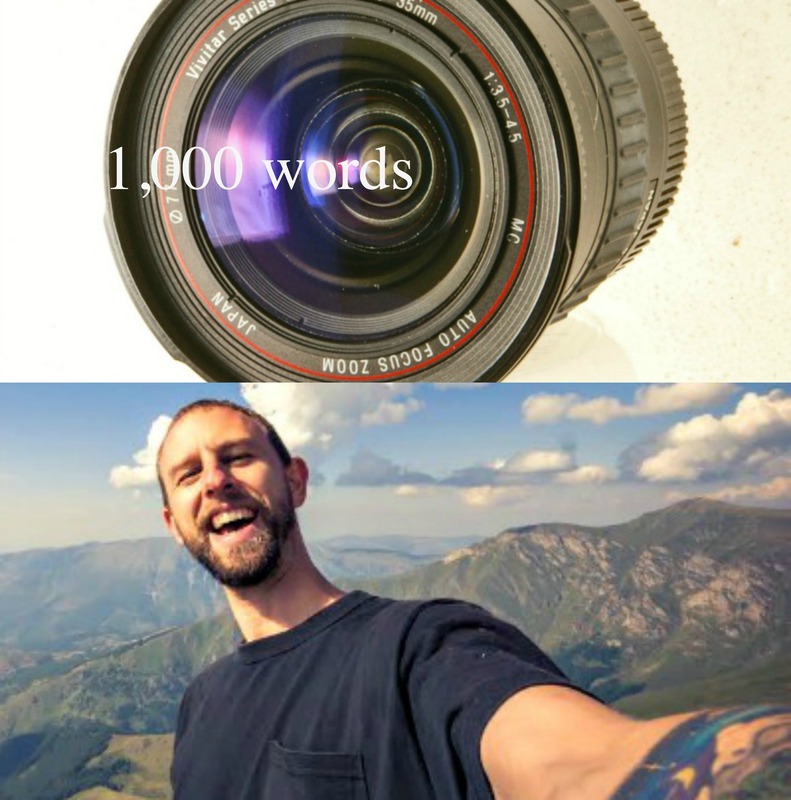 And now it’s time to meet Dave and hear which of his photos he thinks speak at least 1,000 words. Hmmm… But are these speaking in German or English—or both?! Let’s find out, shall we? Welcome, Dave, to the Displaced Nation. Let’s start as James usually does, by asking where you were born and when you spread your wings to start traveling. I was born and raised in Massachusetts, USA. My folks split up when I was ten and I bounced between two houses every other day/weekend for several years. I think that set me up for the flexibility you need when traveling. After hosting an exchange student from Switzerland who ultimately became a great friend, all I wanted to do was go abroad and learn a second language. By the time I got to college, I was already looking into semester programs in Europe. After a few adventurous bus trips across America, I finally left U.S. shores in 1999. With snowboarding as a top priority in those days, I wound up in Austria. Yes. Fifteen years later, two new languages and my own tricultural family, I am living in Salzburg, a small city nestled into the northern ridge of the Alps. I think we’ve all heard of it thanks to Julie Andrews and The Sound of Music. But I’m curious, why did you choose Salzburg as your base? The city is bursting with cultural flair, historic relevance, architectural splendor and immediate access to crystal clear lakes and imposing mountains. Not to mention the best of all four seasons. Basically everything a budding photographer could dream of. My wife, also from elsewhere, found a great education here, and we’ve both been fortunate to find good jobs. We’ve never had a reason to leave. Wow, it sounds as idyllic as it looked in the film! I understand you’ve lived in Austria for 15 years. How many other countries have you visited during that time? Nearly every country in the EU plus Serbia, Kosovo, Macedonia, Albania and Tunisia. And, though I’ve only lived in Austria since leaving the United States, I’ve spent extensive time in Switzerland and in Kosovo on account of friends and in-laws. And now I’m excited to get into the substance of our interview, the photos, especially as I’ve been to your photography site and find your work pretty amazing. Let’s start off by having you share with us three photos that capture some of your favorite memories of the so-called “displaced” life of global residency and travel. I’ve often traveled the Balkans, visiting friends and more recently, in-laws. I took this first shot in Prishtina, Kosovo, in 2007. It captures the moment when I realized that I would never have seen a United Nations SUV that had been dirtied by actual service in a war-torn region,had I failed to venture beyond my small town in New England. Definitely a “You’re not in Kansas any more” moment! What’s next? 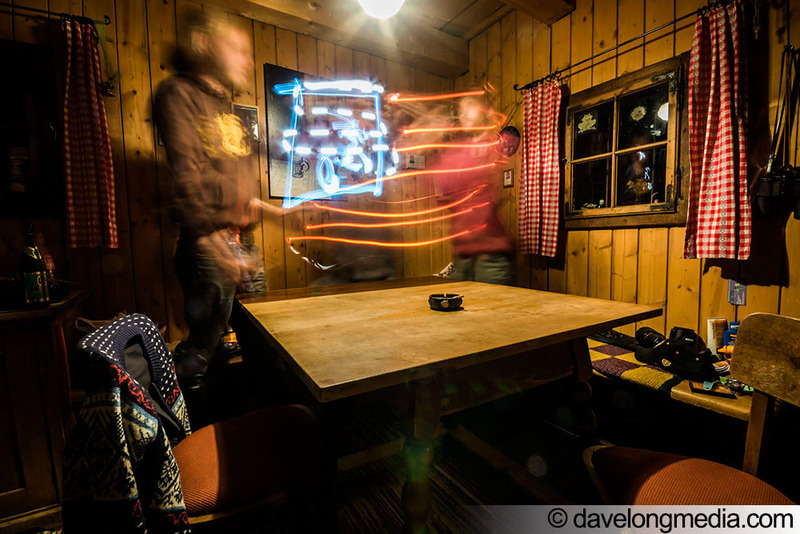 High in the Alps, at a friend’s cabin in the forest, our mixed group of Austrians and Americans ultimately turned to light-painting after more than a few rounds of local Schnapps. I’ve found nostalgia to be a rare, but welcome, companion during my life abroad. Having been abroad for as long as you, I can really relate to the nostalgia so wonderfully expressed in this shot. And your last one? 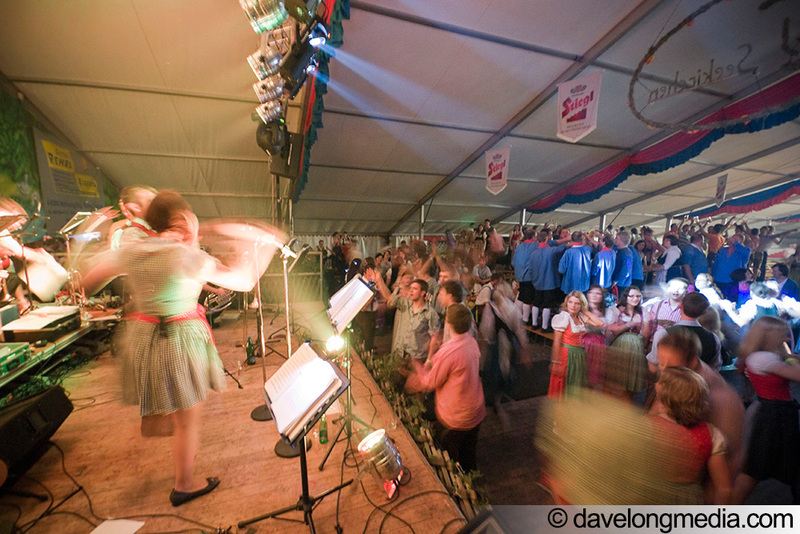 Playing lead guitar with an Austrian brass band to rowdy crowds at rural beer tent festivals was definitely not something I envisioned when I left home years ago. Had I known how much fun it is, I probably would have left even sooner. Moving on: Tell me the top three locations where you’ve enjoyed taking photos thus far—and can you offer an example from each place? And finally Salzburg, because it’s nearly impossible to take a bad photo here. And now for the examples. Here is Struga, Macedonia, in the late afternoon, which brings out the raw beauty of this historic lake town. Next I’ll share a photo of Lowell, Massachusetts. 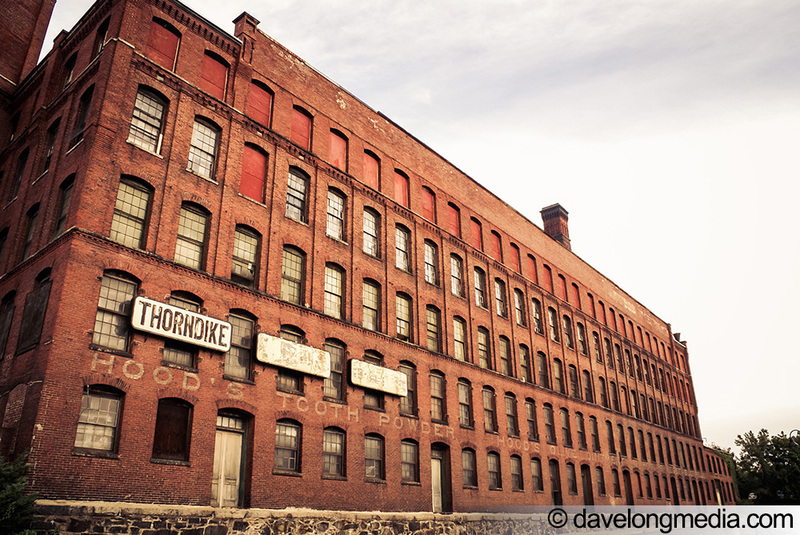 Growing up nearby, I never paid much attention to the red brick factories. Now they seem like original backdrops in Hollywood films about the industrial revolution or working-class boxing legends. Finally, I offer two from Salzburg. Here is one of an Austrian girl in traditional dress reaching out across space and time to grasp the hand of a boy from an immigrant family. (Unfortunately, that’s a politically sensitive topic here, and all over Europe, these days.) I captured it while testing a new lens at Salzburg’s version of the Oktoberfest (called Ruperti Kirtag). I love seeing the range of the places where you’ve been—definitely speaks to the displaced life! Okay, time to move on an ethical question. I know the last photo you shared was staged with a friend, but I wonder: do you ever feel reserved taking photos of people, particularly when they are conscious of your doing so? I’d be concerned about a photographer who didn’t sense the importance of a subject’s privacy. That said though, some of the best street photos are those that capture a person’s candid nature. This sort of photography is difficult in Europe because the laws are extremely restrictive. I’ve found the best approach is to take the photo you see, then approach the subject in a friendly way, explain you’re a photographer and that the person has just created or been part of a unique/beautiful/extraordinary moment that you captured. If they ask, share the photo and if it works out, ask them to sign a model release so you can publish the photo later. And now over to the technical nitty gritty. What kind of camera and lenses do you use? From 2005 to 2008 I was the editor in chief and co-founder of “packed magazine,” a free bimonthly magazine distributed at hostels all over Europe. We wound up acquiring a Sony a100 for the magazine, the first SLR Sony released after taking over Minolta. I’ve been a Sony man ever since, having owned the a700 and a77. I’ve also stuck to prosumer lenses from various brands because so far that’s all I’ve ever needed to get the job done. It’s always been important for me to have the full focal range from 8mm fish-eye up to 300mm tele in various forms of primes and zoom (those are aps-c focal lengths). I love my kit, but I’m keenly looking forward to building a new set based around Sony’s compact full frame a7 line of e-mount cameras and lenses. I’m slowly and stubbornly learning (admitting) that full frame bodies simply produce a level of quality that just isn’t possible with an aps-c sensor. I’m not sure I followed that last part, but I’ll leave it to others, more technical than I am, to work out. What about post-processing software? I only shoot in RAW format and post-process in Camera Raw, Photomatix Pro and Photoshop. For the traveler: Just do it! Seek the unknown. But also be open to the possibility of staying in a place that seems like it’s trying to keep you if it feels right. For the photographer: Enjoy the mid-day hours by not planning on taking any photos. At the most, snap some candid street photos and macro stuff as it comes. Explore the destination by day and keep track of places you’d like to shoot later during the golden hour or early next morning (with your tripod!). Also never return to your hotel/hostel/etc the same way you left! Editor’s note: All subheds are lyrics from Sound of Music songs. Readers, what do you make of Dave’s experiences? If you have any questions for him about his European adventure and/or photos, please leave them in the comments! If you want to get to know Dave and his creative works better, I suggest you visit his photography site. And don’t forget about his book, Daheim Away from Home. Yes, James, I do think you need to come back. As much as I enjoyed talking about photos rather than books for a change, I am pretty clueless when it comes to the technical stuff. (I know you pretend to be clueless, but I suspect that it’s just an act!) I was pretty intimidated by Dave, needless to say!